I am with the current stable (3.4.1). I don't know if it's the same with 3.4.2. In the clipboard I don't have anything open, you could be that PlayOnLinux itself is the cause. It would be interesting to see if you had the same issue running the game with 3.4.2. I've found that the Editor's autocomplete would crash on Gnome 3, but I've never been sure that I've got WINE setup correctly. Yes, me too. The editor itself will actually run, but the majority of the functionality to edit a game are currently in a library that is not cross-platform. I tried it on Linux Mint, but PlayOnLinux failed a lot. I don't know how it will go with Debian (or another distro) and a desktop like XFCE or KDE. I think that for the next versions of the engine they should work on multiplatform (Linux and Mac). That and pass to 64 bits the file where the sprites are stored to remove the restriction of the maximum 2GB. I suppose the core will have to be very fine-tuned, but it will be beneficial for the future. pass to 64 bits the file where the sprites are stored to remove the restriction of the maximum 2GB. I began working on this. Ok I decided to test the AGS 3.4.2. I am on Ubuntu 16.04, used Playonlinux. The FIRST TIME I opened, I got an Error from Playonlinux/Wine, but I didn't pay attention to it. 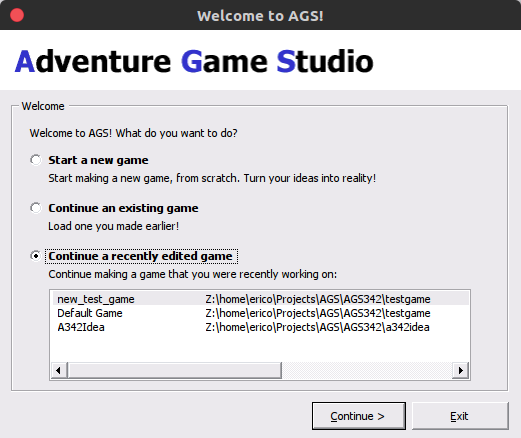 After clicking ok, the AGS Editor proceed to open normally. Now I can close and open it, and all works. I created a project using it, I selected Default Template, and it created TWO projects with the name of my project, one called Default Game, and one called new_test_game, but both are the same project? Other than this I did some more testing and it appears to work. All I have to say is that I REAAAALLY like being able to see Walkable areas together with the characters. This is the greatest thing in here. Other than this, in all ags versions I have, it doesn't build the Linux version on Wine. I thought this one would be different because you had removed the takeown thing, but somehow something else must be blocking (I don't know yet what though). Oh yeah, I loaded and built my game successfully. I really like the new Room Editor, it's much much better, being able to hide things is great because I have lots of object that I only use when loading a room and then get rig of them. It was tricky to differentiate between the recent game entries, as the data was just a collections of string (so external to a change of project name). I'm not sure how making a new project would show two entries, but potentially it could have migrated one of them from an old entry, from an older Editor version. If it deduplicated by path, the correct project name needs to come from somewhere. Actually I had noticed this, but for some reason I had forgotten to mention it. Believe it or not, but it looks like I made support for files over 2GB. Tested with 4.5 GB of sprites. WARNING: this version modifies data format of some files, and you won't be able to use saved sprite file with older editor even if it's smaller than 2GB, so don't open your real project yet without a backup. Hey, when I modify the project, build, and exit, and click yes to save, it crashes PlayOnLinux. Weird thing is doing the same running PlayOnLinux on Debug DOESN'T crash it. Oh reading the log I get it why it doesn't work the Linux build, instead of just copying the files, AGS creates hardlinks - and fails. I would prefer it just copied the files over - or gave me an option somewhere to do this instead. There is more than just 64-bit file support in this test build, compared to latest officially released one there is also room design state serialization. Is there a way to know better what causes the crash? I do not understand the log, it posts a lot of warnings there. Normally it should fallback to copying if hardlink fails. Again, is it possible to find out at which point in code it fails? Perhaps this explains what I saw, when the file was still being written whilst the engine was trying to open it. It might be the attempt to create a hardlink is triggering a copy as a fallback, but it isn't a blocking operation. I have a question: does anyone use this version already to make the real game? Assuming I may change savegame format a little without assigning it a new version index, breaking saves in this WIP version, because I don't want to keep and support the previous incorrect variant, would that be a problem to anyone? Hey CW, sorry, I really have no idea how to get more insightful logs from playonlinux and wine. I am sea visiting family this week, but once I get home I should probably also test on wine on Mac to see how it's working there too. I don't know if it was clear, but on Linux the crash I got was after closing ags. Apparently nothing got corrupted, so things are fine, but if something changed on the closing of ags since previous version it would worth a look. Also I am on 3.4.1 and will be for some time. Following the previously made suggestions from the few people, this version is now called 3.5.0, and since we decided to drop WinXP support there is a strong reason for a distinct major version. - Support for large files: single game package, sprite file, room files now may exceed 2 GB. - Fixed editor preferences were saved separately for editor installed in different folders. Now they are shared between all installations of same version of AGS regardless of the program path. - Save room editor's design-time config (item Visible and Locked states). These settings are saved in the special roomXXX.crm.user files and loaded when you open room in the editor. - SetMouseBounds() no longer crashes the game if it is called with arguments out of range, these parameters are corrected and a warning logged instead. - Fixed 'warnings.log' could never be created (was broken somewhere in 3.4.1 probably). IMPORTANT WARNING: because of added >2GB file support some of the data formats were updated. Most importantly rooms and sprite file will become incompatible with previous versions of the Editor. Also savegame format changed slightly and I dropped support for the savegames made by 3.4.2, because that version was never actually finalized. That could be get back, but only if it's really-really necessary. Please make backups of your games before opening them in this version, and tell if something does not load up after this update (except 3.4.2 savedgames). The reason seems to be that all the AGS .net assemblies were changed to strong names. This is a breaking change, as the plugin compiled with an existing assembly (e.g. the plugin references AGS.Types) with a weak name is not compatible with the new one compiled with a strong name (see the following link https://stackoverflow.com/questions/15092577/weak-assembly-changed-to-strong-assembly for more details). Is there a particular reason the assemblies now use a strong name? A small note, the latest Alpha 4 made in August has number of mistakes that may prevent building game correctly under certain circumstances: noteably building speech.vox or audio.vox (I was actually surprised no one reported these, but guess not much people actually test this version yet). I was going to upload an update that fixes them, but decided to wait a few days more to see if the above issue with editor plugins will resolve. Has all content from AGS 3.4.1.14 (Patch 4). - Raised imported sprites count limit to 90000* and removed total sprite count limit (this means you may have around 2 billions of dynamic sprites). - (needs more testing) Fixed that existing Editor plugins could not load up with the new Editor. - Fixed crash when deleting a room object. - Fixed audio.vox and speech.vox not building correctly. KNOWN ISSUES: Editor crashes on exit. This may be same bug eri0o reported a short while ago. The crash takes place only after game is saved and window closing and seem to not make it loose any changes. The total number of sprites (imported + dynamic sprites) are now limited only by number stored in 32-bit signed integer (over 2 billion). Thanks for taking care of the plugin probllem so quickly. I'll test this next week, based on the other thread, I believe the devised solution would work. Just got around to test it with the latest plugin and it works.